The Camelford-born winger started out in local football with Co-op United and Torpoint Athletic, and also had a brief association with Bournemouth as an amateur in 1934. After returning to Torpoint, Rich crossed the Tamar to join Argyle the following year, but found the step-up hard, making just three appearances in the 1935-36 season, with one goal. Perhaps frustrated by the lack of opportunities, he quickly moved on to Luton Town, for whom he played 19 times. In 1938 he returned to Devon to join Exeter City, where he played 32 times and notched up four goals. In 1939 he was registered with Stockport County, having played twice before the outbreak of war put a stop to the League programme, and as it turned out, Rich's Football League career. 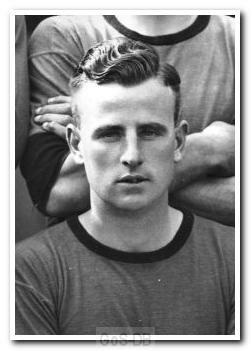 Even though County held his registration until 1945, he was recruited to play for Argyle again as a guest in the South West Regional League at the tail end of the 1939-40 season, when he scored four goals in two appearances, including a hat-trick against Bristol Rovers at home in May 1940. This meant he finished with a prolific, albeit peculiar, career total of five goals in five games for Argyle, in all competitions. Although Len Rich is not a name that comes up in any conversation about Argyle greats, he was involved in one of the most remarkable events in Football League history. On Monday 13-Apr-1936 (Easter Monday) he turned out for Luton Town in a Third Division (South) home fixture against Bristol Rovers. Luton led the table and Rovers were third bottom. The two teams had met in Bristol the previous Friday and drawn 2-2. Luton then drew 0-0 at home to Millwall on the following day. Luton made just one change for the Rovers fixture, dropping centre forward Billy Boyd to experiment with out of favour wing half Joe Payne. It was just his seventh game in a Luton shirt and his first since September 1935. He was yet to score a goal. By the end of the game he had become Luton's leading scorer, scoring an incredible TEN times in a 12-0 victory. It remains a Football League record for an individual and is the second highest score in a Football League match.